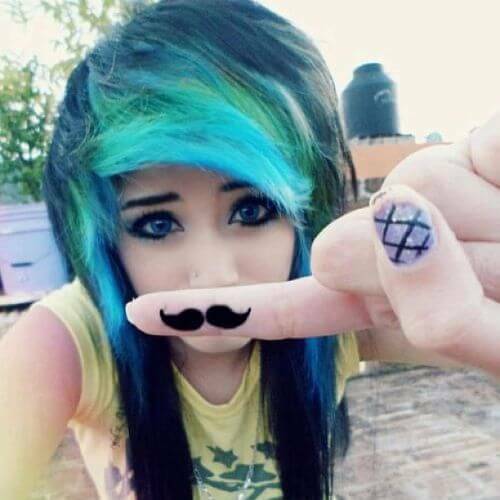 Emo hairstyles for girls have reached a popularity peak a few years ago. Nonetheless, thanks to their versatility and attractiveness, they have remained among the top preferences of girls worldwide. Emo hairstyles took on new life once a new rock genre emerged on the popular culture scene. A signature look, emo hairstyles typically involved the fringed jet black hair covering most of the wearer’s face. Nevertheless, long gone are the days when emo hairstyles for girls were restricted to the jet black hair color. More recently, an explosion of colors and extra style elements have enriched the variety of emo hairstyles for girls, but not only. 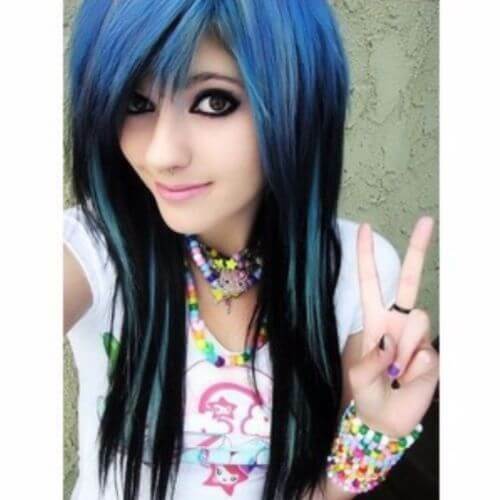 We bring to your attention the cutest, edgiest and most inspiring 60 emo hairstyles for girls. If you like to stand out from the crowd, try these styles. They’re unique, creative and certainly personal. 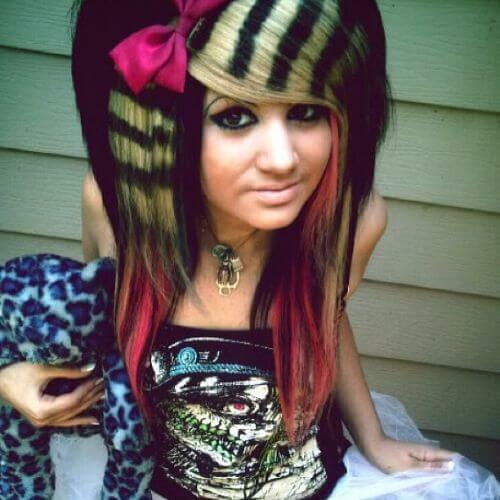 This is one of the classic emo hairstyles for girls. Featuring the jet black hair that made these hairstyles popular in the first place, this is a remarkable emo hairstyle for girls. Thanks to the attentively styled layers and fringes, this hairstyle is flattering for all hair types, from thick to thin and fine. Hairstyles for emo girls have suffered some alterations since the early days. 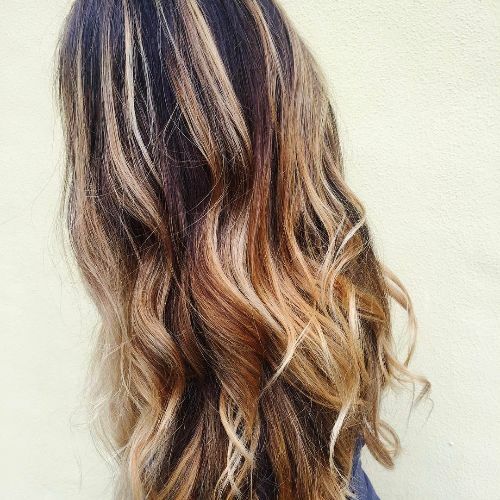 This stunning look includes contrasting golden highlights that mix beautifully with the natural dark brown hair color. Make this look your own and you’ll be able to rock it anywhere. 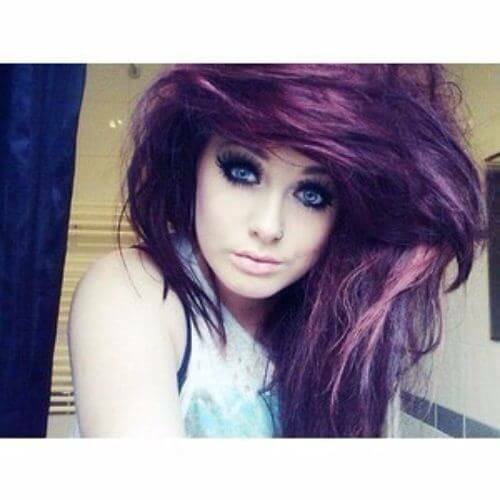 This is a must-try emo hairstyle for girls with medium hair. While the enchanting color duo can work swiftly on both short and long hair, it’s better to apply it to medium-length hair. We think it’s the best way to enjoy the full-color spectrum and the stunning effect. Short emo hairstyles for girls have become quite popular in recent years. Make a statement appearance thanks to this gorgeous color that’s bound to make you noticed anywhere you may go. The fringed and teased hair creates a remarkable structure, enhanced by the deep green hair color. We promised to bring emo hairstyle inspiration at the tip of your fingertips. Here it is. An explosive hairstyle combining fiery red highlights and platinum to ash blonde hair in one of the best emo scene hairstyles for girls. When jet black emo hair meets this deep shade of blue, you get an explosive blend of complementary colors which are cool and eye-catching at the same time. Apply the deep blue on the framing bangs and fringes to achieve the full stunning effect of this emo hairstyle for girls. 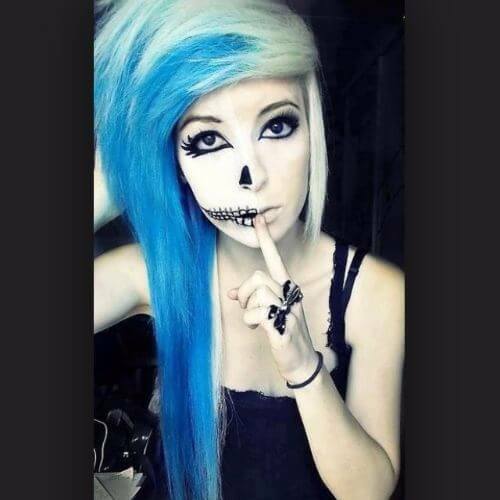 Although medium-length and short emo hairstyles have risen to popularity recently, long emo hairstyles for girls remain in the top preferences. Teased top and iron flat long sides contribute to the full emo look. Blunt bangs create a certain type of structure for fringed emo haircuts. 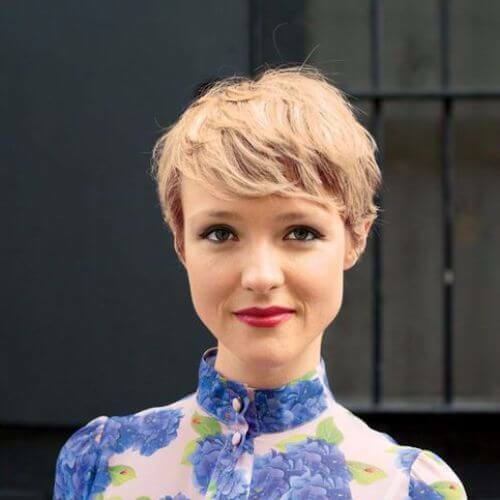 Swipe your bangs to the side and you’ll achieve an entirely new look in just a few seconds. Let them cover your forehead to the point that your face features are still revealed and your look will change once more. Try this style element as a versatile tool for instant look changes. A toned down yet rich color, auburn fits perfectly in the emo hair colors spectrum. It’s dark enough to retain the air of mystery and melancholy of the jet black color. 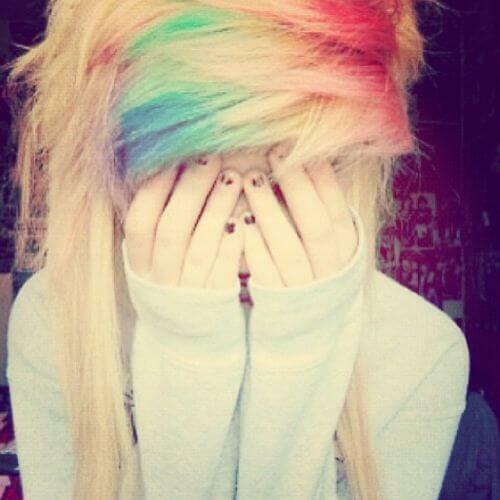 At the same time, it’s the taint of color that brings an emo hairstyle for the girl under the limelight. Sometimes, medium hair may fall flat despite the teasing and fringes characteristic to emo hairstyles. This is why using a vibrant hair color like this deep blue and creating a hairstyle that includes a deep side part may help you create more volume and depth for your hairstyle. Fringes? Yes, please. Layers? Of course. These are the two constants of emo hairstyles for girls and guys alike. The versatility of these hairstyles is rendered by the fact that according to your hair type and the texture of your hair, the layers can be longer or shorter. This allows for different hairstyles each day. 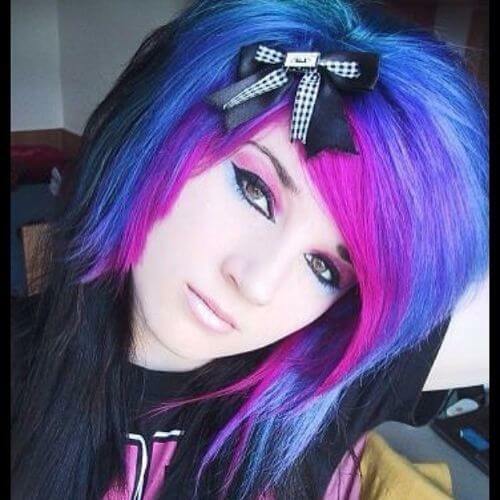 Do you want to sport one of the most electric emo girl hairstyles for long hair? Try on this electric blue hair color. You won’t fail to get noticed. 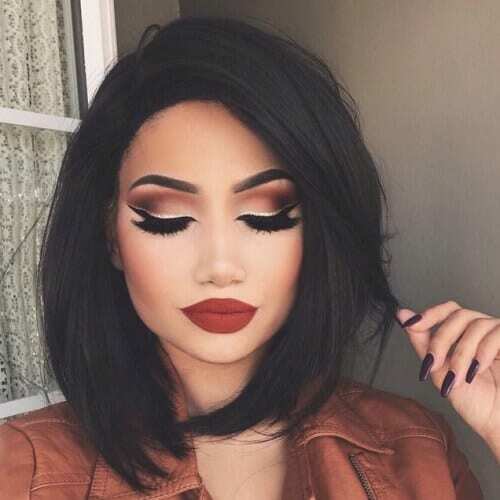 This short hairstyle for girls looks simply stunning. 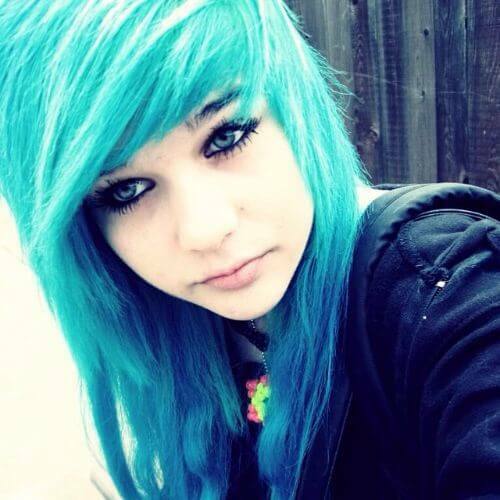 The light blue hair color adds a soft note to the edgy overtone of this emo hairstyle for girls. 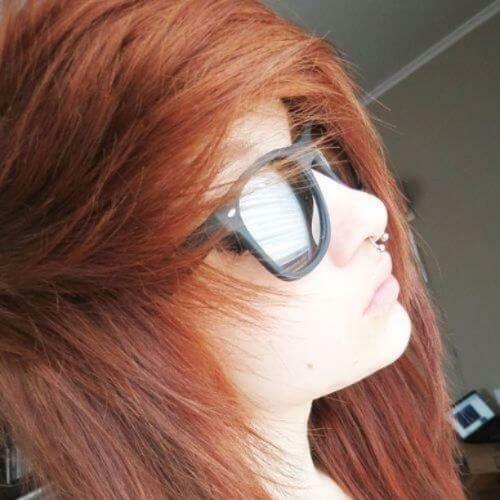 Volume is key to most emo hairstyles for girls. This girl is sporting a stunning long hairstyle where the effortless volume is created by teasing the fringed hair on top. 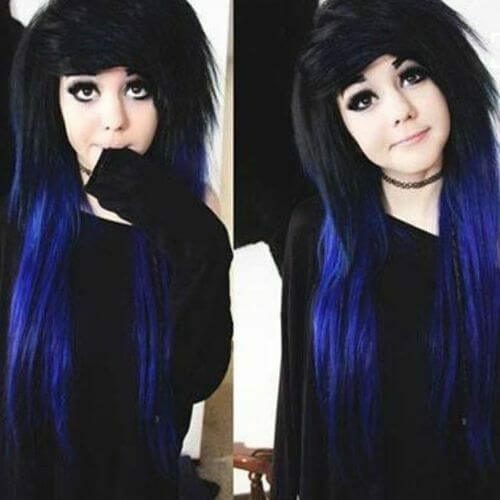 Reminiscent of anime characters hairstyles, this black meets blue long emo hairstyle for girls is a great hair inspiration idea. 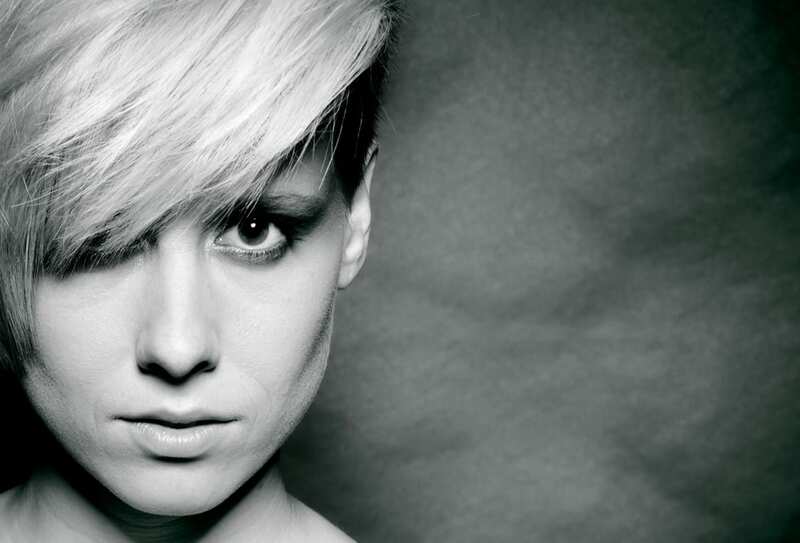 Edgy yet cute, this short hairstyle is a must-try. The shaved undercut and the animal print pattern contribute to an eye-catching look that you will want to sport. Coontail hair is all the rage now as far as emo hairstyles for girls are concerned. In all possible color combination, these powerful style elements add an extra edgy note to your look. This perfectly styled red emo hair may be just what you need if you’re looking to wow everyone around you. Accessorize with a cute hair piece like this headband or hair bows. Bangs are a must have when it comes to emo hairstyles for girls. It may be that emo hairstyles for girls with curly hair aren’t quite compatible with bangs. 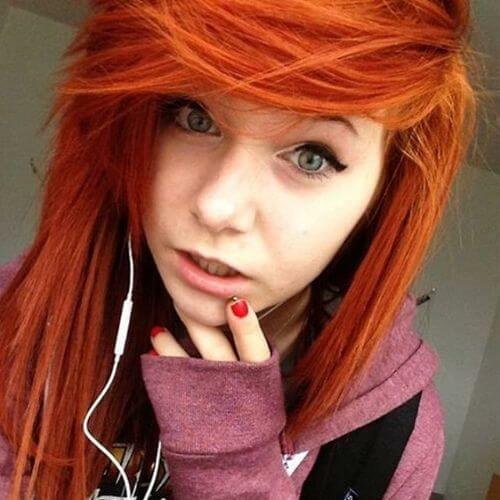 However, other emo hairstyles embrace bangs. 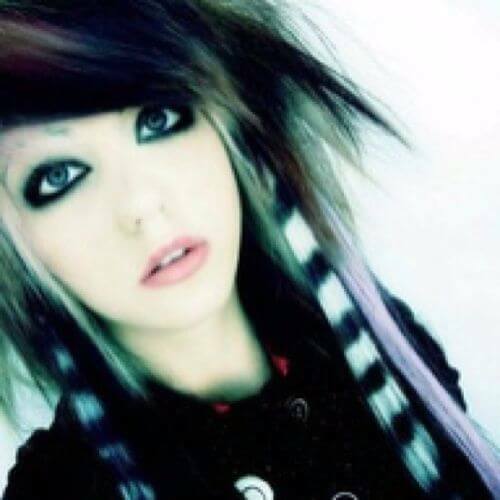 If you wish to flaunt an emo hairstyle, it doesn’t have to be in a flashy color or the classic jet black. Try a natural color like this enchanting warm brown. Your haircut will look just as great. 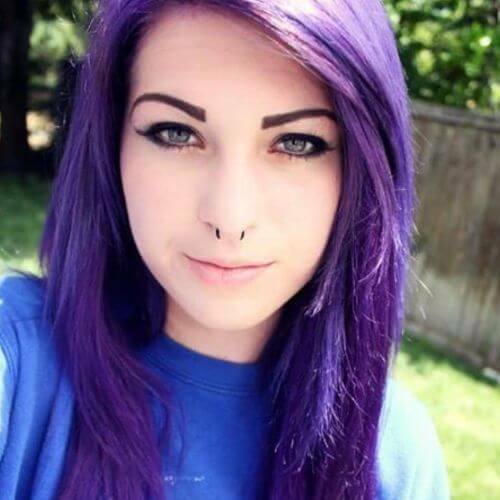 This is another instance of a natural hair color applied to an emo hairstyle. It’s here to prove that you can look as stunning even by adopting a more natural hair color for women. Pastel colors are a great way to lighten up your look. Also, if your base color is a light blonde hue, their intensity will be even more enhanced. 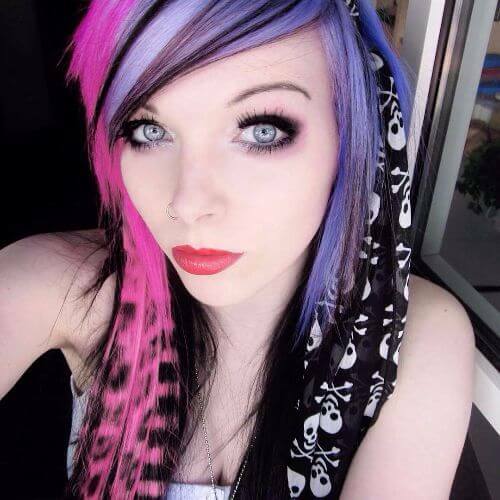 This coloring idea looks fantastic with emo hairstyles for girls. If you wish to spice up your emo hairstyle, try this style element: coontail hair. This coloring technique mimics the striped tail of a raccoon. The difference is that you can basically use any colors you wish in any combinations you wish. Red hair colors are astonishing whether applied to long hair or short hair. This tamed yet stacked short emo hairstyle is simply astounding. This hairstyle is super versatile as it is perfectly suited for a more formal environment, as well as for attending your next favorite gig. 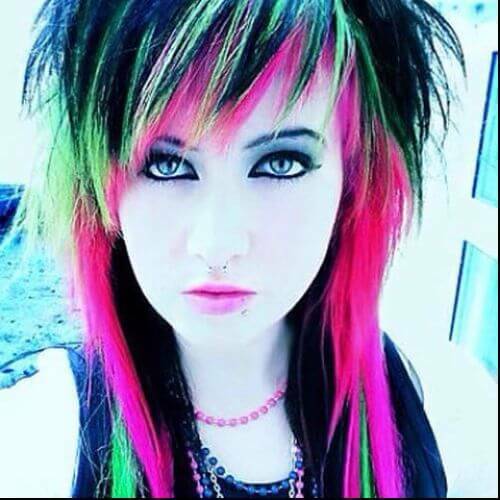 Provided you only want a taint of color for your emo hairstyle, go for the duo color bangs. This green hue ideally complements the jet black. With such a soft and cute look rendered by the blend of colors, there’s no reason why you shouldn’t go for the high top. This medium length haircut has a strong personal note thanks to the ideal choice of hair color. This dark copper flatters any skin tone, while the high top and teased bangs flatter your facial features. 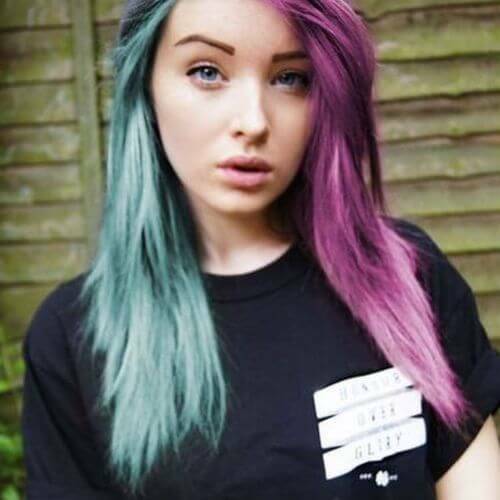 Forget the dull colors conventionally linked to emo hairstyles for girls. Go for a playful and new hairstyle in all the colors of the rainbow. Set the flat iron aside for a while and let your natural curls shine even with your fringed and layered emo haircut. Long emo hairstyles are the most versatile. You can create a new look each day and stand out from the crowd with minimum effort. Color your bangs in a strongly contrasting color and you’re bound to draw attention. We told you that the days of the jet black hair color are long gone. You can experiment with these intense hair colors and add powerful elements like the coontail hair. 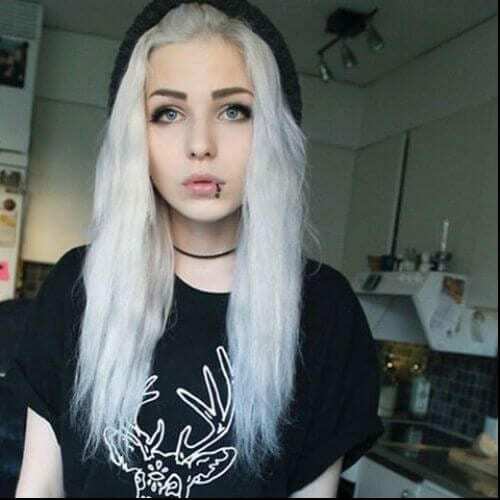 Emo girl hairstyles for long hair can look as natural as this platinum blonde hairstyle right here. If it suits your personality, go for it. Rainbow fringed bangs, teased top and long flat sides contribute to a mesmerizing look that will make you shine. Break the style boundaries by creating this stunning asymmetric hairstyle. A buzz undercut and fringed ends add an even edgier note to the overall look. Medium length hairstyles are ideal mediums to experiment with strong colors like this tangerine hue. If you have fair to medium skin, go for it. It is flattering and the medium length of your hair will make it shine even stronger. 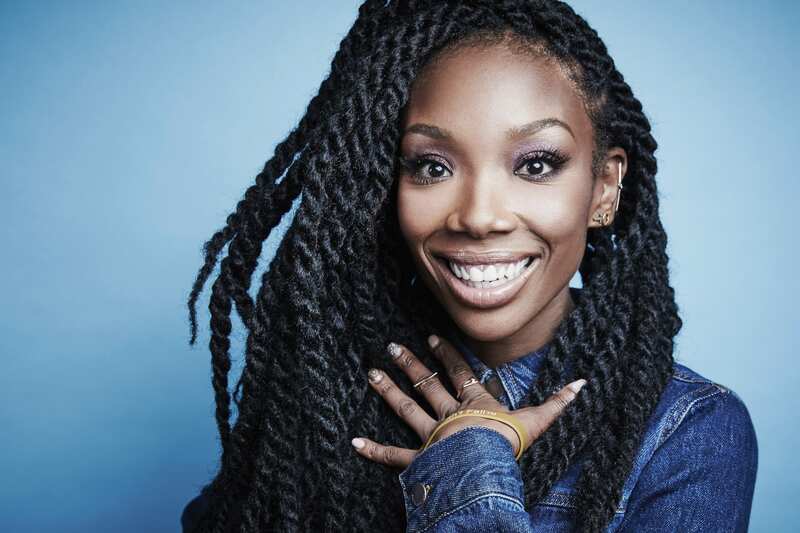 Another lovely example of a natural hairstyle that follows the style rules of scene hairstyles for girls. The warm brown hair color and the fringes create a lovely structure and reveal the healthy texture of the hair. Free flowing messy strands, coontail hair, perfect bangs and a teased top. These are the style ingredients of this cool hairstyle blending purple and black for an explosively vivid note. 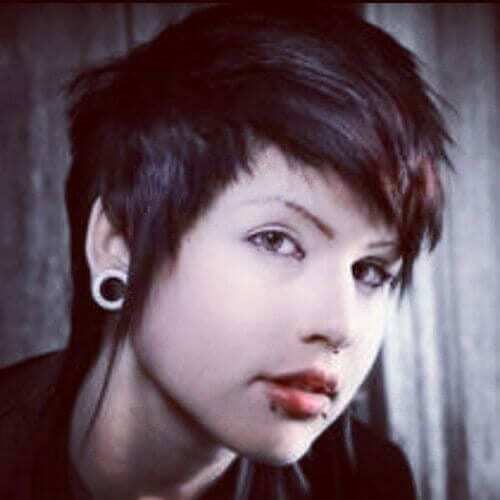 Emo hairstyles for girls with short hair can’t get any classier than this stunning example. Albeit its complexity, this haircut renders itself perfectly to a myriad of styling possibilities. Leave it to your hairstylist to create the perfect layers and slightly fringed bangs that will bring this look under the spotlight. It’s also a perfect style for girls with thick hair who want to keep the structure but lose a bit of the volume. Coontail hair is a relatively new style element that has made its way into emo hairstyles for girls. Whether it’s on short length or long strands of hair, coontail hair looks just as intriguing. Make this detail your personal style element. Are you looking for a more natural long emo hairstyle? Try these tamed yet eye-catching hair colors. Applied skillfully, these hair colors will blend into a style which perfectly reflects your personality. Lighten up the mood around you this summer with this enchanting blue hue. It’s certainly bound to draw some hair envy. To achieve this hairstyle, all you need to do is straighten your hair to perfection. Add some taints of color here and there and your work is done. It’s classy yet playful, edgy yet sufficiently formal. Hairstyles in simple jet black colors remain in the top preferences of emo hairstyles for girls. Sometimes, black or dark hair colors aren’t too flattering. Try a light color instead. This warm blonde hair color is perfect to flaunt during summer and year ‘round too. We’ve come a long way since the days of the jet black emo hairstyles for girls. 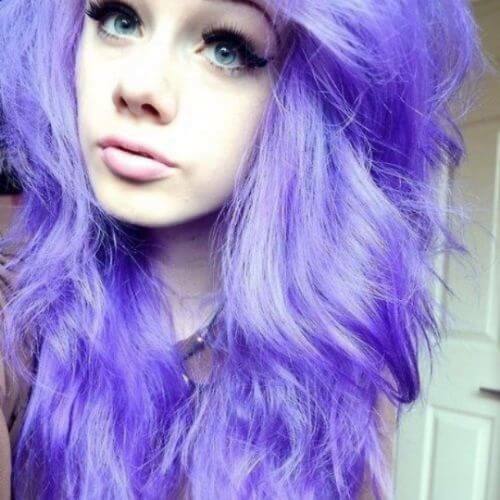 Nowadays, you can sport any hair color from pastel pink to blonde hues and green, to this stunning purple hue. First of all, we love how she has her hair twisted in a side ponytail with added oomph. At the same time, we couldn’t help but notice that the hair color is rather unusual for emo hairstyles, yet stunning nonetheless. It is the small details that make a difference. 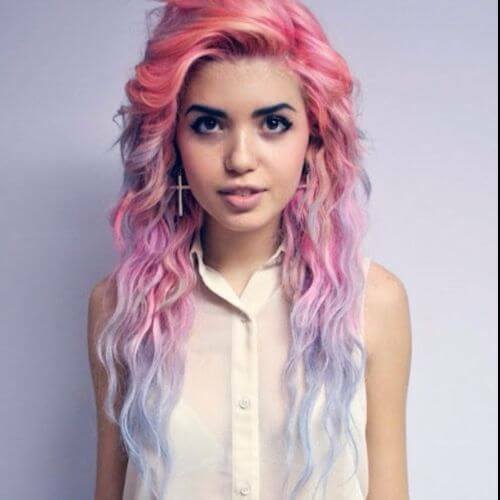 Pastel rainbow hair looks feminine, soft and lovely. Try this hairstyle on for size if you’re looking for a summery style that everyone adores. Emo hairstyles for girls aren’t restricted to the iron flattened strands. Layered curls styled in perfect cascades are also part of the scene hairstyles category. One way to add some spice to your emo hairstyle is to use hair accessories. Use a hair bow or headband for an added element of style. Alternatively, you can use a bandana that’s easy to style in a bow and looks cool. 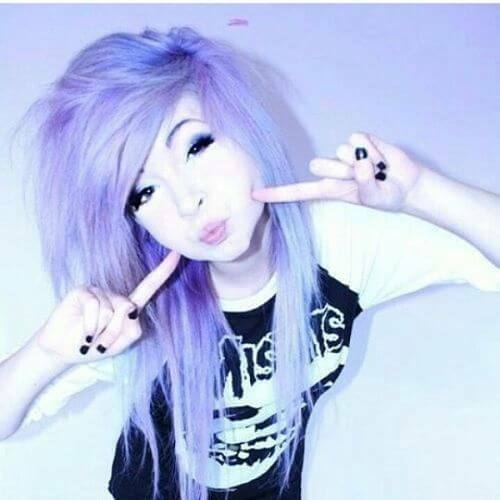 Pastel purple is an ideal color for your next hairstyle. It adds an extra cool tone to your overall look. Plus, it’s one of the trendiest hair colors this summer. 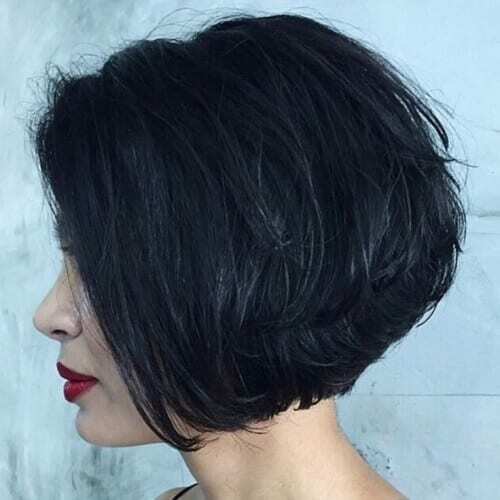 If you’re looking to cut off some volume from your natural thick hair, try this layered haircut. 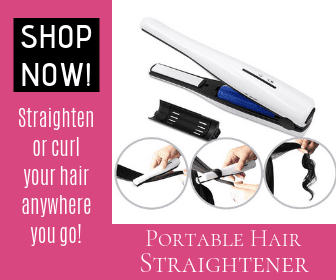 Style your curls in loosely flowing waves. Whether it’s predominantly black or predominantly blonde, your hairstyle will look astonishing if you use this combination of colors. They’re ideal for highlighting the fringes and bangs perfectly framing your face. This trend is a relatively new entry in the scene hairstyles preference tops. Nonetheless, it’s gaining more and more momentum. We can’t deny the versatile good looks. The more layers and fringes you sport, the more structure and depth you create for your hairstyle. Use the hair color as another trick to enhance volume. It comes as no surprise that these two popular hues create astonishing looks. This soft yet edgy hairstyle is another must try during the summer. Embrace your natural waves and curls with this wavy emo hairstyle. We told you that these hairstyles aren’t reserved just for straight, silky smooth hair. Here is the proof. Have a break from classic colors used for emo hairstyles for girls and indulge in this rich red hue that’s bound to draw all attention to you. This candy cane pink hue looks cool, feminine and delicious at the same time. In all fairness, such a beautiful hair color takes the edge of the clean cuts sported by such hairstyles. 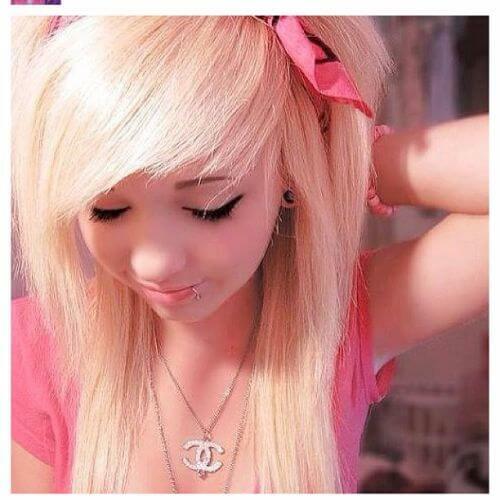 Emo hairstyles for girls are still trending. 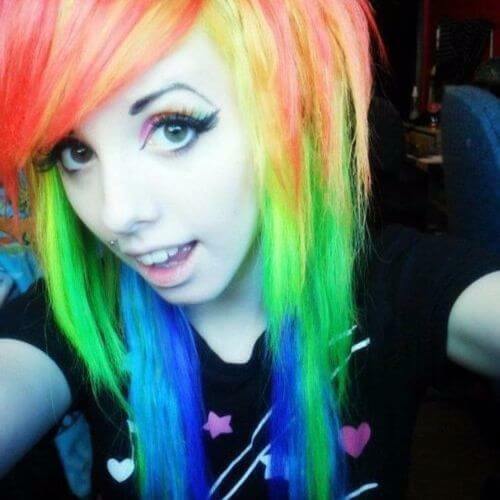 Find your hair inspiration in no time with these 60 great ideas on emo hairstyles for girls.